Put Backgrounds as the h1 and title content. Now add a new paragraph element under the heading. Put some text in it. Any text is fine. Save and view. The page should have a green background. Add a new rule set to the styles. This is to style all p elements. In this rule set add a rule to make the background colour red. Save and view and it should look something like the screenshot. You have done colour backgrounds before but images can be better. They can be horrible and slow as well though so pick your background images carefully. One approach is to use a small texture which can be repeated on the page. You can use a single image as a background but then how will you choose an image that fits on all screens perfectly? Download this image and save it to the folder which contains backgrounds.html. The first line identifies the image file to use. The second says to repeat that image all across the page (known as tiling the image). Save and try. It is best to leave the background colour there as well. It will be used if the image does not work for any reason. Try a couple of experiments. Use a different image (maybe a bigger one but still smaller than your screen - a photo). Try it with and without repeat. 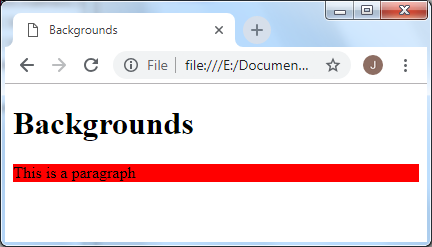 CSS does allow you to use background images which fit the screen (or other element) but you will learn that later as it does not always work easily.